Jonny Lee Miller, best known as the theatre actor, also accomplished his wings profoundly in television and English-American movies. While Jonny is mostly known for his character Simon “Sick Boy” Williamson in the dark comedy-drama film "Trainspotting", his personal life somewhat resembles as the on-screen character. SickBoys' journey to married relationship stumbled a huge rock before finally settling down to peace. As a matter of fact, he married twice in his life, however, his first marriage didn't sort out. Let's see what actually had happened that caused a chaotic circumstance in Jonny Lee Miller's married life. English Film Actor Jonny Lee Miller Married Relationship: Who Is his Wife? The English actor Jonny Lee Miller aka "SickBoy" married to the second love of his life Michele Hicks in 2008. She is an American screen actress and former model best known for her appearances in Law & Order: Special Victims Unit and Law & Order: Criminal Intent. In 2018, she portrayed the role of Michelle Goldstein in Orange Is the New Black. Jonny Lee Miller and his wife Michele in 2011. Like other strong couples, they had a quality time to know each other well. And yes, Michele and Jonny started dating back in 2006. Reportedly, the pair first met at a local bar while Miller was introduced to his future wife through a mutual friend. Eventually, the duo started dating and often had a quality time before finally walking down the aisle. Recommended: British Actor Ben Barnes Hooked-Up With Many Girls; Is He Now Married And Happy With His Wife? After dating for about two years, Jonny decided to take their relationship to the next level. Miller and Hicks vowed "I-Do" in a wedding ceremony held in Malibu, California in July 2008. The "Romeo-Juliet" then indulged into the love and have been inseparable ever since, which is truly admirable. As for the children part, the couple went on to welcome their only child Buster Timothy Miller in 2008. 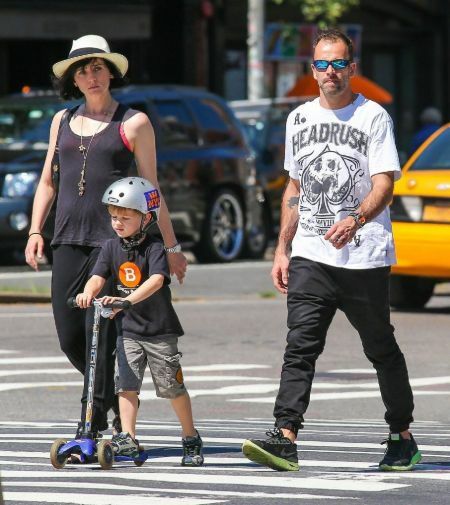 Jonny Lee Miller, his wife Michele Hicks and their son Buster Timothy Miller, in NYC. Happy mothers day to the coolest, most loving and badass Mom a kid could wish for. Grateful to be your baby daddy Michele and thank you for giving me an angel. Be that as it may, there are no controversies and extra-marital affairs after they pair hitched together that may hinder the beautiful lovey-dovey of these two. However, Jonny previously had a public relationship with beautiful American actress Angelina Jolie. As a matter of fact, Jonny was even married to her! Before walking down the aisle with Michele, he was in a married relationship with "Lara Croft" actress Angelina Jolie. Jonny Lee Miller and his ex-wife Angelina Jolie. On 28 March 1996, Jonny Miller tied the knot with Jolie. But no longer, their romance lasted as the duo separated nearly 18 months after getting hitched. Also, Read: Angelina Jolie files for divorce from long term partner Brad Pitt. They married in 2014. Jolie and Jonny divorced in 2000, however, they remain close friends. Angelina, 43, more recently is in controversy of secretly dating fellow Irish actor Colin Farrell which is very upsetting news to her former spouse Brad Pitt, whom she married in 2014 and divorced two years later. Well, this isn't any strange or peculiar thing to the gorgeous actress. After a year of her divorce with Jonny, Angelina immediately leaned onto American actor Billy Bob Thornton. Yes! she married Billy in the year 2000 and citing irreconcilable differences the couple had a spiteful divorce in 2003. Jonny Lee Miller was born on November 15, 1972, in Kingston upon the Thames, Surrey, England, UK. The British actor Jonny is the son of mother Anna Lee and father Alan Miller. Both of his parents are theatre actors who involved in stage productions at the BBC. Miller attended Tiffin School where he portrayed several roles in plays including The Ragged Child and the Tiffin Swing Band. As of 2019, Jonny Lee Miller's estimated net worth is $14 million.